It's the $215 billion question the travel industry is trying to answer: What do Chinese tourists want? The huge figure is the amount they spent abroad last year, way more than anyone else. And it's only going to grow as Chinese citizens get richer and travel more -- by planes, trains and, increasingly, ships. Cruises, in particular, are a booming business. The number of Chinese cruise ship passengers more than tripled between 2012 and 2014 to 697,000, according to brokerage firm CLSA. That made China the world's seventh biggest market, and CLSA says it has the potential to one day take the top spot. "You see this amazing transformation that's occurring in terms of a consumer society. We see outbound travel growing quite dramatically in Asia Pacific," Royal Caribbean International CEO Michael Bayley told CNNMoney. His company is among the big international operators rushing to cash in on the trend. Royal Caribbean's most technologically advanced cruise ship, Ovation of the Seas, headed straight for China after delivery earlier this year. Its arrival has helped boost the number of passengers Royal Caribbean (RCL) can accommodate in China by more than 40%. Carnival (CCL), the world's largest cruise operator, is also betting on the growing market. It currently has six ships based in China, with three more joining next year and another two arriving by 2020. The industry's third largest company, Norwegian Cruise Line (NCLH), is preparing to enter the Chinese market by the middle of next year. Royal Caribbean is adapting its ships to suit Chinese tastes. That means more shopping and gambling facilities, as well as new restaurants. A "Kung Fu Panda"-themed noodle bar has replaced the Johnny Rockets diners usually found on Royal Caribbean ships. 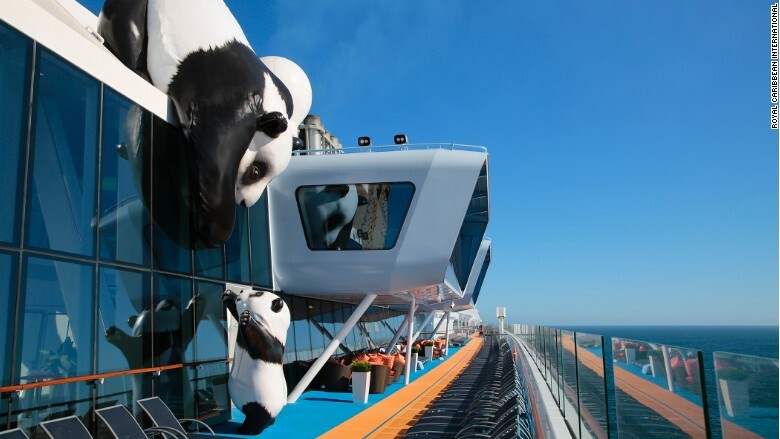 Ovation of the Seas even has a $4.5 million art collection on board that includes a 33-foot tall sculpture of a panda looming over the ship's deck. "Chinese tourists like an international feeling but also appreciate the reminders of home," said Jane Jie Sun, a senior executive at CTrip, China's largest online travel agency. She attributes the strong demand for cruises among Chinese tourists to how suitable they are for large groups, such as big family gatherings. And there's a large part of the potential market that remains untapped: CLSA says only 15% of Chinese travelers surveyed for its research have taken a cruise. 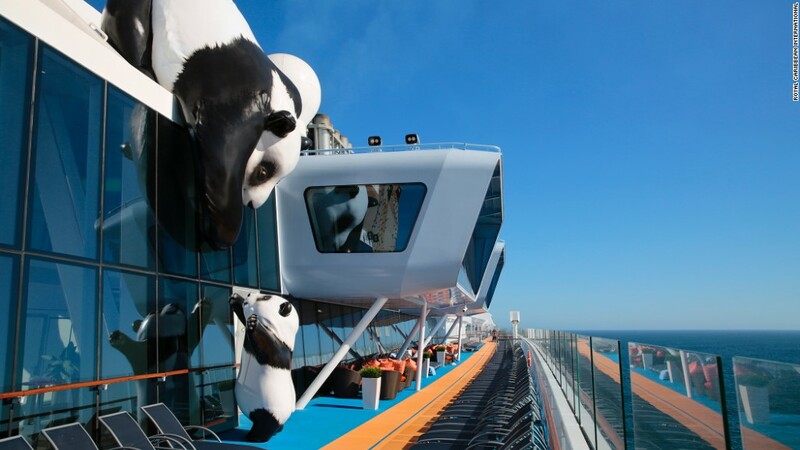 Giant panda sculptures on the Ovation of the Seas, a Royal Caribbean cruise ship that's operating from China.